Book One — Invasion! — is DONE!! Dolley Madison is my favorite character in American history, and the reason is this woman is not only courageous and heroic, risking her life to save things for posterity; this is a woman who is beloved, the most beloved woman to ever occupy the White House, admired and respected by the rich, absolutely beloved by the poor. Until that moment I considered Dolley Madison the over-hyped rescuer of a single painting, a feat unworthy of the inordinate laudatory gushing I’d heard from numerous teachers over the years. Pitch and the documentary then explained why Dolley was a Really Big Deal. It was more–much more!–than rescuing a poor likeness of George Washington. On the 191st anniversary of the burning of Washington I purchased Anthony Pitch’s extraordinary book The Burning of Washington – The British Invasion of 1814 at the Fort McHenry gift shop. On the flight home I outlined The Forgotten Adventures of Dolley Madison. I still have that outline: it’s one page long. One page! It reflects everything I didn’t know about Dolley and the War of 1812. In March 2010 I began writing, certain that I could complete my tiny novel by August 2010. It’s now August 2012, and the novel’s length approaches 420 thousand words. Sure, it will shrink some during the final editing, but that’s a big freakin’ book, and final editing, done all at once, will take a loooooong time. Young Dolley learns dueling skills on a lark, then practices them to relieve stress, daily, for sixteen years. When she and her servant slay murderous brigands, US Army Rangers help them cope with the grief of taking human life through rigorous training, training the women continue after returning to Washington City. A year after America declares war on Great Britain the women witness British atrocities at Hampton, Virginia, and vow to fight back. The first to feel their wrath are American traitors, but when four thousand British soldiers land at Benedict, Maryland and begin marching towards Washington City, the war becomes personal. The first third of Invasion! lays the foundation for the entire story, answering: who is Dolley Madison? Sukey? Why are these two women fighting? How did they train? Could they really be that good? I may release this part as a free E-Book entitled Preparation! It would still be included, of course, with print and e-book versions of Invasion! Progress: Editing this was tough, as it contained the earliest-written scenes, horrible scenes! Most required a complete rewrite. Some required radical expansion, as explained in Wargaming a Battle – 24 August 1814. I’m currently rewriting the last scene, and will then begin detailed editing. Should be out soon. 19 October 2013 Update – Invasion! is at the editors. Finally! Will first appear as a book on Amazon.com, then as a Kindle e-book, then in other e-book formats. 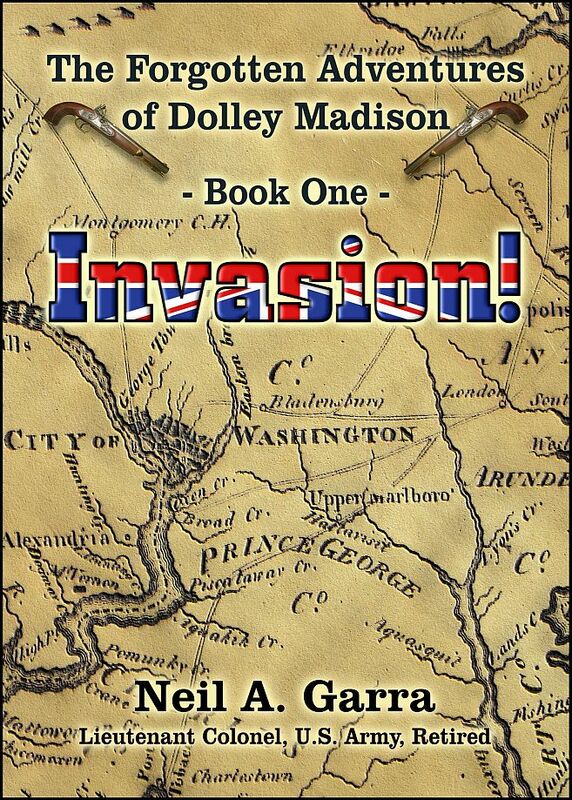 Dolley discovers a Loyalist plot to guide British soldiers around the unguarded flank of Fort McHenry, then finds herself targeted by a powerful, ruthless organization that supports the British in exchange for eventual rule of conquered America. Fleeing with her companions down the Ohio and Mississippi rivers, terrified of what might be happening to her husband in Washington City, she discovers the most dangerous threat to America yet, masterminded by America’s most notorious traitor. Progress: This is the only part still missing scenes. I saved them for last because they have to be solid, explaining why, exactly, Dolley decides to travel from Baltimore to Washington by way of New Orleans. If I get this right, you, as the reader, should agree wholeheartedly that homesick, war-weary, misses-her-husband-desperately-and fears-for-his-safety Dolley is making the right choice by taking a five thousand mile detour in the Age of Horse & Sail . . . before reading of all the cool things and people she encounters en route! Ten thousand British veterans, the same soldiers who defeated Napoleon, are sailing to New Orleans to capture the city and then drive north to split the nation along the Mississippi and Ohio rivers. General Andrew Jackson knows their plans, and knows his victory depends on rallying the people and convincing Jean Laffite and his Baratarian Corsairs to join him. He also knows that nobody on God’s green Earth is better at rallying people or making allies than Dolley Madison, but never dreams just how far she’ll go to settle her score with the British. Progress: Draft completed. Most of Retribution takes place in and around the various battles for New Orleans, and figuring out the real sequence of action from a dozen conflicting sources was a challenge, as was finding Dolley a suitable job during the actual fighting. After all, with thousands of American Infantry butchering British soldiers by the hundreds, how can she really contribute? Final Note — This isn’t a trilogy, but a three-book novel that will eventually find itself within a single volume. The idea came to me while reading J.R.R. Tolkien’s biography, which explained Lord of the Rings wasn’t a trilogy, but a six-part novel published in three books because of post-World War Two printing constraints. Immediately upon reading this I knew it was the solution to my timeliness issue, and immediately knew what to name my three books: Fellowship of the Rangers, The Two Tribes, and Return of the Presidentress. Noting that something was missing, I realized I could take the parts describing Dolley’s sixteen-year dueling ritual and make a prequel: The Habbit. Alas! Seemed like a good idea at the time.